A number of local dancers have been rewarded for their talents, with the National Dance Foundation of Bermuda awarding $47,500 in scholarships to nine young Bermudian dancers. “Mr. 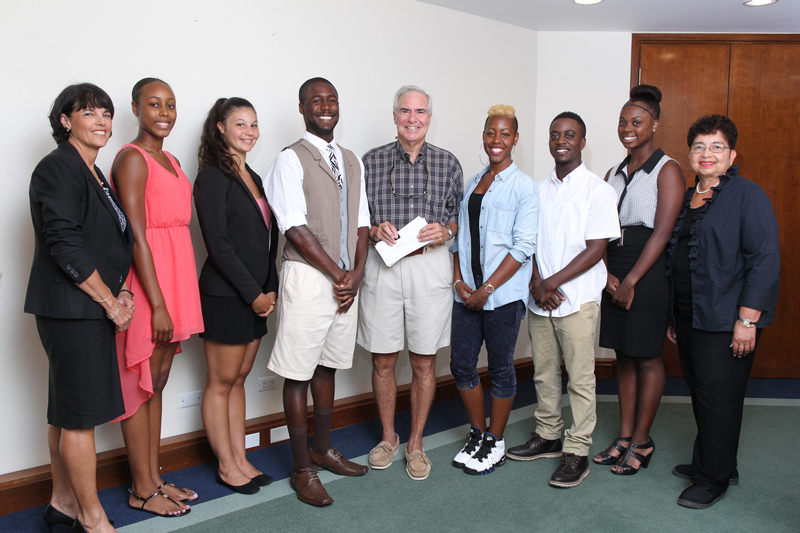 Brian O’Hara, Deputy Chairman of the National Dance Foundation of Bermuda, today awarded scholarships and bursaries to nine young Bermudians to benefit from world-class training overseas. Since 2005, nearly $1 million has been awarded thanks to the charitable generosity of individual and corporate donors in the community,” the Foundation said. “Unanimous in its decision the scholarship committee presented the most prestigious award of $15,000 , the Catherine Zeta Jones Scholarship in honour of Patricia Calnan, to 19 year old Marcus Smith. “An exceptionally talented Bermudian he is already achieving an exemplary reputation entering his sophomore year at New York University Tisch School of the Arts. The artistic director of a NYC based touring dance/theatre company has noted that Marcus is one of the finest students he has had in recent years. “Two awards have been generously supported by the Montpelier Re Foundation over many years. Their $7,500 scholarship in honour of Madame Ana Roje was awarded to Taylor Railton who will be studying for her BFA/Dance degree at State University of New York , SUNY Purchase. “The second Montpelier Re Foundation award of $7,500 in honour of Mrs. Georgine Mary Russell Hill, a former member of the National Dance Foundation’s board, goes to Eryn Beach. “The BF&M award for $7,500 in honour of L. John Profit, has been sponsored by this company since the scholarship’s inception and the Foundation is deeply grateful to BF&M for their committed and generous support. “Gina Bradshaw, Vice President of BF&M Company Life, who knew John Profit well, presented this award to Jada Pearman. Jada, a top notch academic student, will be studying dance at the University of Arizona. “The Don and Elizabeth Kramer Bursary and Professional Development Fund Awards have been generously sponsored by the Foundation’s Chairman, Donald Kramer and his wife, Elizabeth. Left to right: Gina Bradshaw, representing sponsor BF&M award, Jadiyah Bailey, Eryn Beach, Marcus Smith, Brian O’Hara, Shaydrina Hassell, Rikkai Scott, Sacha Dill, and Dr. June Hill presenting the Montpelier Re Foundation Award in memory of Mrs. George Mary Russell Hill. Missing from photo: Jada Pearman, Taylor Railton and Dara Palmer. “One Professional Development Fund award was given to Shaydrina Hassell who is in her final year at Drexel University where she is completing the Creative Arts Therapy programme which will combine her qualification in social work with dance movement therapy. The Foundation is very interested in what this relatively new genre of therapy can mean to our community in the future . “The second Professional Development Fund Award was given to Rikkai Scott. Previously an award winner for three years, Rikkai had the opportunity to dance for a season in Amsterdam. The Foundation has been delighted to see Rikkai giving back to the community this past year by teaching dance lessons and performing and wish to assist him when he returns to London this autumn. “A bursary award was given to 20 year old Jadiyah Bailey who will be majoring in dance at Edgehill University in the UK. The Committee has been impressed by Jadiyah’s thorough research and hard work. “Sacha Dill, a 22 year old Bermudian, has been awarded a bursary for demonstrating unwavering commitment, perseverance , deep determination and a passion and joy for dancing. Last year Sacha was Bermuda’s 2014 “So You Think You Can Dance” champion and will be furthering her dance studies in Chicago. “A busary has also been awarded to Dara Palmer, a previous scholarship recipient who will be completing her final year at Cornish College in Seattle. Upon graduation she hopes to join a professional dance company.